The next figure to be reviewed is Sean Mctaggart of the Iron Fist (click on the pictures for full image). The general appears to be a man in his middle age, as is implied by the slightly receding hairline and added bulk. He gives the impression of a man who's seen it all and won't race into combat in the reckless manner often associated with youth. He doesn't wave his sword in the air, but rather let's it rest against his leg, saving his strength for actual combat. Detail is sharp and the distinct facial traits, with the big moustache and long sideburns, give plenty of character to this mini. He is a bit more ornately dressed than his sister, with a long cape, held together with a small gem and he appears to be wearing a mail shirt under his tunic. Other than that he is dressed in a similar manner as the Lady Valentina and the same comments apply. Size: about 32mm sole to eye. Sean is riding a Gargant, a naturally occuring rare breed found only in the Connaught Highlands. According to the Newbold background the Gargant is more solidly built than the Gant, is faster and has more stamina. If the Gant model was big, this Gargant is even bigger and makes for a truly impressive mount. Sculpting is very good, with sharp detail. The equipment of the horse is different from the one on the Gant, but equally good. As you can see on the full size picture, the back of the saddle is rather high. However the bottom of the rider has a similarly shaped indentation (between his lower end and his cape), which fits the saddle and makes for a perfect fit. The rider's cape is nicely draped over the back of the horse, instead of folded against the rider's back as is usually the case. These features, along with the impressive size of the beast, make for a very attractive whole, where rider and mount almost seem to become one symbiotic organism. In English: they were made for each other and it shows. 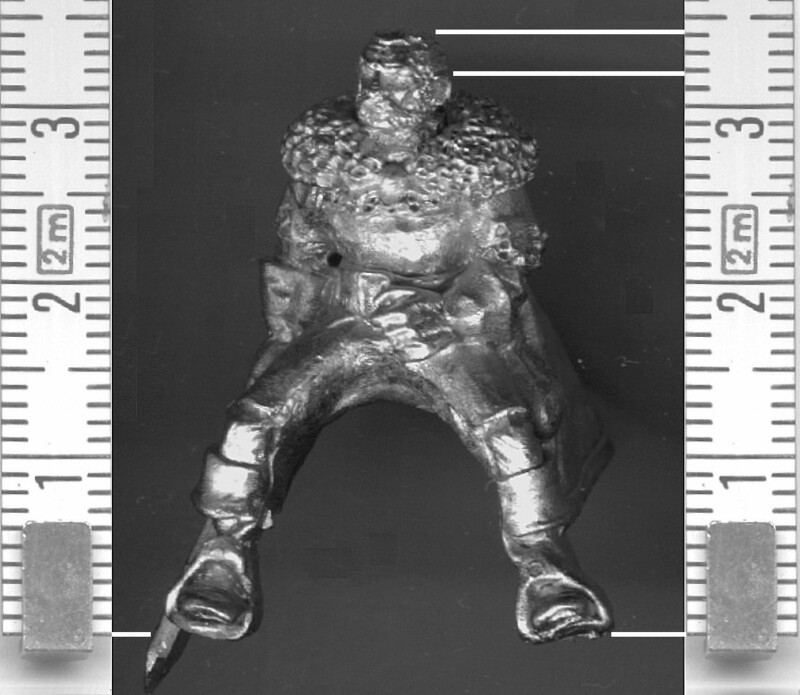 The third figure is Lord Kafelnikov of the Umanga. The Umanga resemble elves and humans in their youth, but become almost skeletal when they get older. They are also bigger than humans, and grow taller and heavier with age. The Newbold World catalogue describes Kafelnikov as fully mature and of average height for his age (6 feet 7 inches). This translates into a 35mm high miniature (about 32-33mm sole to eye), so this guy is big. The overall figure inspires an air of ancient nobility, with the helmet almost Napoleonic in design and striking a relaxed, somewhat expectant pose. Holding what appears to be a pair of fine gloves, he looks every bit the general overlooking the battlefield from a distant hill. Being a mature Umangan, Kafelnikov looks very vampiric, close to skeletal. Along with the described characteristics, this makes him very suitable as an ancient vampire lord. Alternatively, he could easily be painted up as a true skeleton. Oe thing that somewhat surprised me was the presence of 'decorative' skulls on the mini (2 on the cape, one on the belt, and one on the sword scabbard), usually added to emphasize the evil nature of a figure (GW is famous for doing that). But then, given the original background for the race, skulls may very well be a sign of honour, reflecting the great age of the one displaying them . 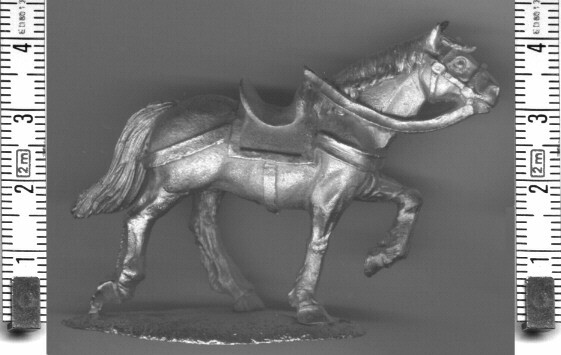 The general's mount is a Megant, a heavy horse favoured by the medium cavalry. This model depicts a sturdy mount, with thick, strong legs, a broad body and a big head. It doesn't look very elegant, but it surely looks powerful. Once again, there is a high attention to detail. Although this is a large model (see the full size image), it doesn't look that big because of the size of the rider. Any regular 28mm figure would look a lot smaller riding this horse. Finally, the last figure is General Chung Lu of the Grak, a dragonoid species. Within the families of Grak subspecies, Chung Lu belongs to the smaller Grak-su and is supposedly just under 6 feet tall. 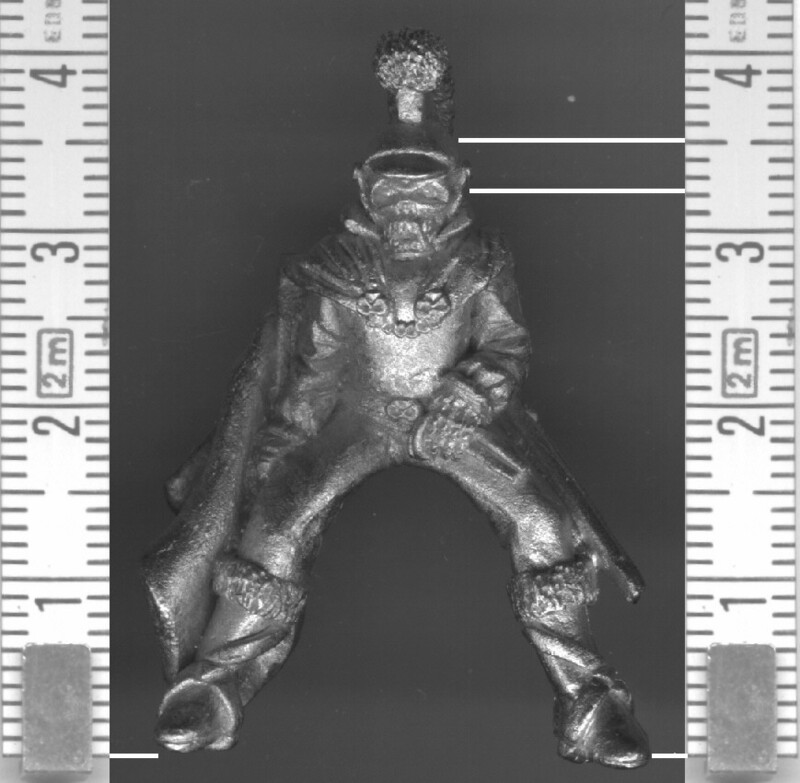 The miniature is about 29-30mm sole to eye, which actually makes it one of the smallest of the four generals. Sculpting is very good once again, with sharp and numerous details. The face is particularly nice, with a beaklike mouth, pointy ears and long horns (above/behind the ears) and an eternal frown, all reminiscent of larger dragons. [None of the current Grak species have wings though.] Chung Lu is rather ornately dresses, with small metal disks attached to his coat in a scale-like pattern, probably serving both decorative and protection purposes. I particularly like how they run down on his back much like a ridged spine. 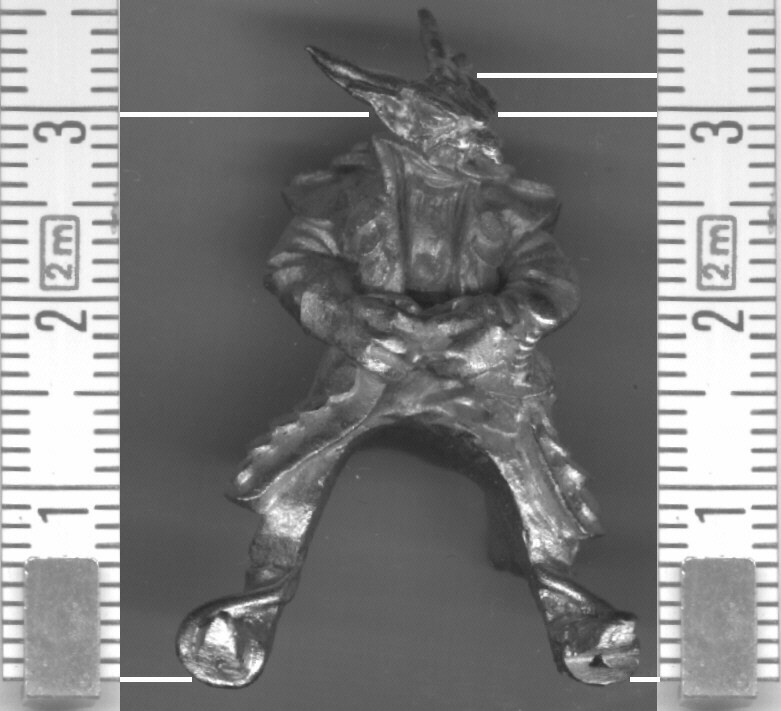 The way his swordbutt sticks out directly towards the front helps to bring out the third dimension in the figure. The general is riding a Jingara, their only breed of horse, which is the lightest and fastest of all the horses on the planet Kendo. The contrast with the previous breed (Megant) is very big. The Jingara model is generally much more elegant, with long, thin legs, a slimmer body and a slender neck. This trend is continued in the equipment with generally thinner reins and no heavy saddle cloth or luggage, the main decoration being a tassle hanging from the front. 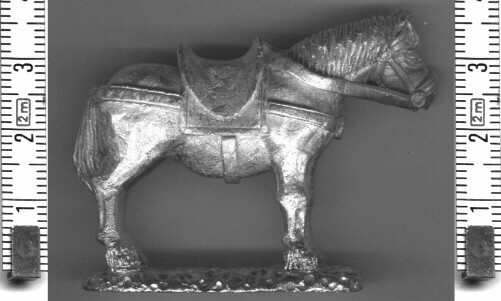 Chung Lu's smaller stature and the general build of the horse make that the rider appears to be sitting much higher above the ground. 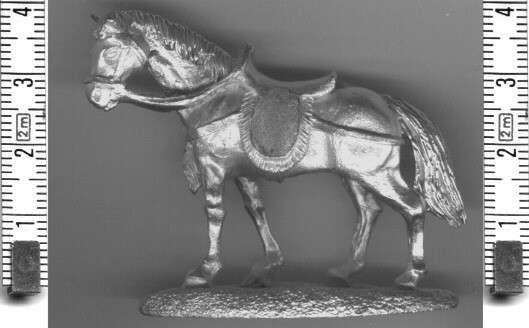 Of the four figures that were reviewed, this is the most realistic horse, both in size and shape, when compared to real life horses. If the legs would be one mm longer, maybe two, this would have been perfect. As it is, this is one of the most realistic horses I have ever seen [although I must confess it doesn't look quite as good in the picture I took as it does in reality]. If you want to find out how these horses really relate to each other and to other manufacturers' mounts, you can take a look at the Horse Scale Comparison page. Click here to go back to page one of this review. Click here to visit the Newbold World Internet Maglet.